Back in 2010, I excoriated the new Prime Minister of the United Kingdom, noting that David Cameron was increasing tax rates and expanding the burden of government spending (including an increase in the capital gains tax!). I also criticized Cameron for leaving in place the 50 percent income tax rate imposed by his feckless predecessor, and was not surprised when experts began to warn that this class-warfare tax hike might actually result in less revenue because the reduction in taxable income could be more significant than the increase in the tax rate. In other words, bad policy might lead to a turbo-charged version of the Laffer Curve. Allow me to elaborate. In most cases, punitive tax hikes do raise revenue, but not as much as politicians predict. As explained in this three-part video series, this is because it takes a very significant reduction in taxable income to offset the revenue-generating impact of the higher tax rate. But if a tax increase imposes a lot of damage and taxpayers have enough flexibility in their financial affairs, then it’s possible that a tax hike can lose revenue (or, as we saw with Reagan’s “tax cuts for the rich,” a well-designed reduction in tax rates can actually generate higher revenue). With that background knowledge, let’s now take a closer look at David Cameron’s tax increases. They’ve been in place for a while, so we can look at some real-world data. Allister Heath of City AM has the details. Something very worrying is happening to the UK’s public finances. Income tax and capital gains tax receipts fell by 7.3 per cent in May compared with a year ago, according to official figures. Over the first two months of the fiscal year, they are down by 0.5 per cent. This is merely the confirmation of a hugely important but largely overlooked trend: income and capital gains tax (CGT) receipts were stagnant in 2011-12, edging up by just £414m to £151.7bn, from £151.3bn, a rise of under 0.3 per cent. By contrast, overall tax receipts rose 3.9 per cent. Is this because the United Kingdom is cutting tax rates? Nope. As we mentioned in the introduction, Cameron is doing just the opposite. …overall taxes on labour and capital have been hiked: the 50p tax was introduced from April 2010 (and will fall to a still high 45p in April 2013), those earning above £150,000 have lost their personal allowance, CGT has risen to 28 per cent, many workers have been dragged into higher tax thresholds, and so on. In theory, if one were to believe the traditional static model of tax, beloved of establishment economists, this should have meant higher receipts, not lower revenues. So what’s the problem? 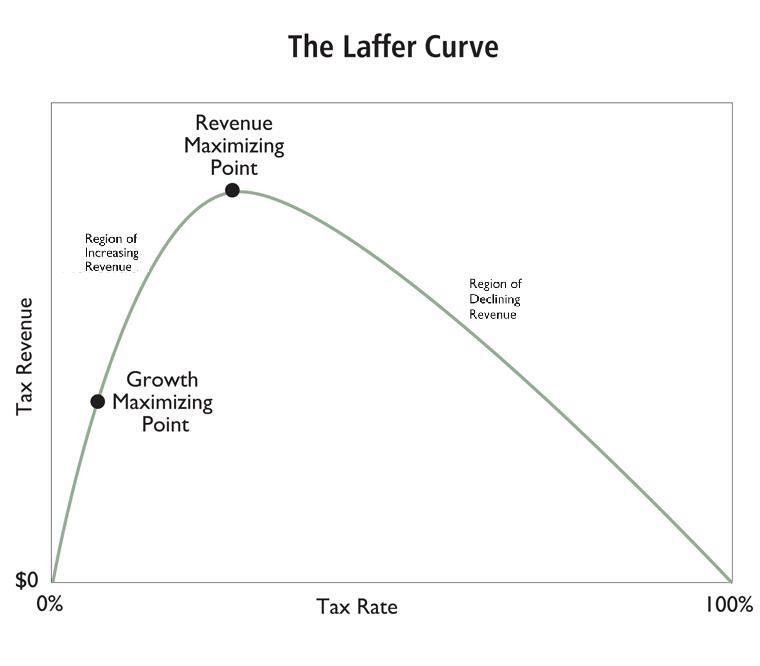 Well, it seems that there’s thing called the Laffer Curve. …there is a revenue-maximising rate of tax – and that if you set rates too high, you raise less because people work less, find ways of avoiding tax or quit the country. The world isn’t static, it is dynamic; people respond to tax rates, just as they respond to other prices. Laffer told a gathering at the Institute of Economic Affairs that this is definitely true in the UK today – and the struggling tax take revealed in the official numbers suggest that he is right. Tax rates and levels are so high as to be counterproductive: slashing capital gains tax would undoubtedly increase its yield, for example. Many self-employed workers are delaying incomes as much as possible until the new, lower top rate of tax kicks in. Allister’s column also makes the critical point that not all taxes are created equal. …higher VAT is also damaging growth, though it is still yielding more. Some taxes can still raise more – but try doing that with income tax, CGT or corporation tax and the result is now clearly counter-productive. 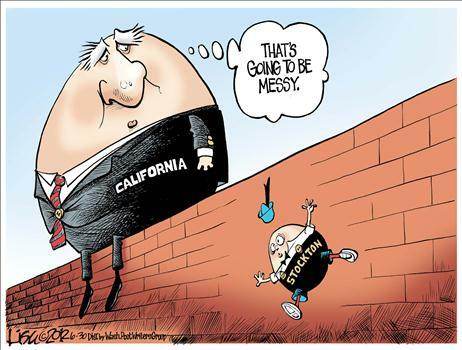 These taxes are maxed out; they have been pushed beyond their ability to raise revenues. Last but not least, he makes an essential point about the role of bad spending policy. The problem is that spending is too high – central government current expenditure is up by 3.7 per cent year on year in April-May – not that taxes are too low. The result is that the April-May budget deficit reached £30.7bn, some £6.2bn higher than a year ago. By the way, you won’t be surprised to learn that Paul Krugman has been whining about “spending cuts” in the United Kingdom, even though the burden of the public sector has been climbing. But given his outlandish errors about Estonia, we shouldn’t be surprised. But that’s not the point of this post. The relevant question is why do politicians pursue bad policy and why do some economists aid and abet bad policy? For politicians, I think the answer is easy. They simply care about getting elected and holding power. So if they think class-warfare tax policy is the way of achieving those narcissistic goals, they’ll push higher tax rates. Even if it means lower revenue, notwithstanding their usual desire to have more money so they can buy more votes. I’m more mystified by the behavior of economists. Let’s look at a couple of examples. Justin Wolfers and Mark Thoma recently cited some survey data to claim that the Laffer Curve was universally rejected by the profession. But as James Pethokoukis of the American Enterprise Institute explained, the survey actually showed just the opposite, with economists by a margin of nearly 5-1 agreeing that lower tax rates could boost GDP (and therefore taxable income). Those economists did say that a reduction in tax rates, based on current levels, would not cause taxable income to jump by a large enough amount to fully offset the revenue-losing impact of the lower tax rate. But the Laffer Curve says that only happens in extreme circumstances, so there’s zero contradiction. So why did Wolfers and Thoma create a straw man in an attempt to discredit the Laffer Curve? I have no idea, but Republican politicians probably deserve some of the blame. Too many of them make silly claims that “all tax cuts pay for themselves,” even when talking about new credits and deductions that have no positive impact on economic performance. To the extent that Wolfers, Thoma, and others think that’s what the Laffer Curve is all about, then their skepticism is warranted. But if that’s the case, they should read what Art Laffer actually wrote so they can be more accurate in the future. Or they can watch these three videos. Part I describes the theory. Part II describes the evidence. And Part III explains the sloppy and inaccurate revenue-estimating methodology of the Joint Committee on Taxation. But if they think I’m too biased or that Art is similarly misguided, then they should look at some of the evidence produced by other economists. The sooner they get up to speed on these issues, the sooner they can help give politicians good advice so that the Laffer Curve doesn’t cause more unpleasant surprises. Welcome Instapundit readers. Y’all may also want to read (here and here) about the Laffer Curve disrupting the plans of French politicians. Heck, even Snooki has teamed up with the Laffer Curve to deny our greedy overlords in Washington.